Heyyyyy 2017. I’m sorry I’m a few days late, but hey, I got a snow day. Spoiler alert: They’re not my favorite because I love to play in the snow or sleep until 1 PM or watch movies all day long. They’re my favorite because I can get a lot done. I’m a productivity addict, and I have a really tough time sitting around or not getting things done (a.k.a. relaxing). So a snow day is like a dream come true because, yes, it’s a day off, but it’s also like a bonus day to WORK. And speaking of getting things done, it’s 2017. And 2017=resolutions. Did you make any? How are they going? I like goals, but I’m always a little afraid of “resolutions.” I checked back in on the ones I made for 2016, and I color-coded them. Red for ones I failed at. Yellow for ones I did ok with. And green for ones I killed. Long story short: There was a pretty nice rainbow across my spreadsheet. But toward the end of 2016, as I started verbalizing this internal monologue to others, I began to realize… I’m not a pro, and I am an amateur. I don’t have a fancy camera, dozens of backgrounds, or millions of props to make my desserts look picture perfect. But I have improved. I’ll be preaching this gospel of non-comparison to myself for the rest of my life, but I’m hoping that in my little corner of the internet, I can STOP comparing myself to others and start being PROUD of what I can do and have done. So here’s a little something I’m proud of, and that I think is fitting to start off a snow AND 2017 with: Malted Cookies and Cream cookies! Listen, we all know that trashing up cookies is my middle name, so here’s yet another piece of evidence to prove that theory. 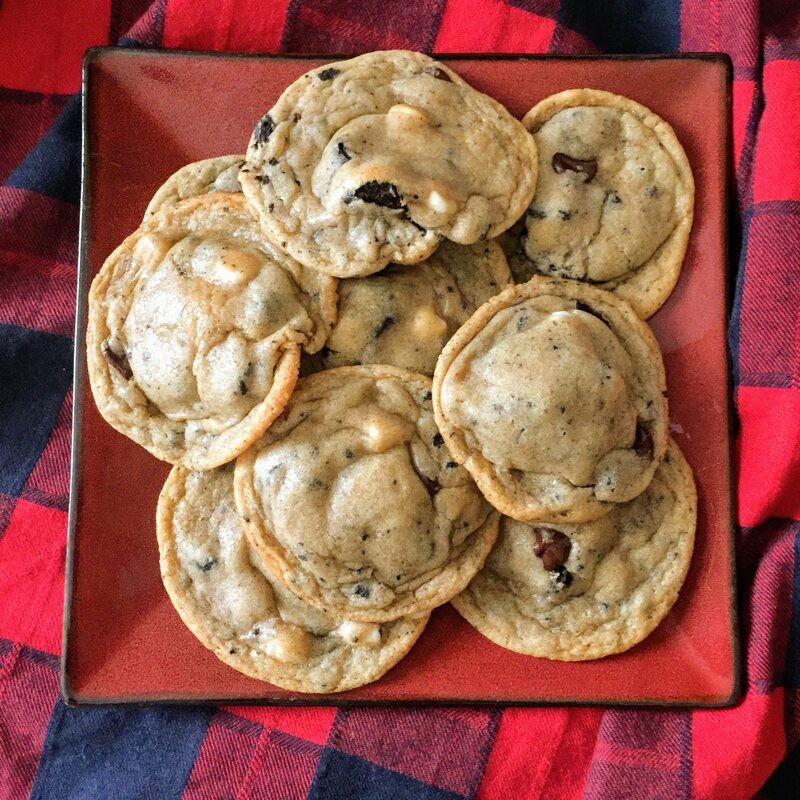 You’ve got your classic malted milk powder, oreos, and chocolate AND white chocolate chips. It all gets mixed up with a nice batch of your classic “I’m just waiting for mix-ins” cookie dough, heads to the fridge (or freezer) for a short vaca, and then heads to the oven for some good old fashioned bake time. 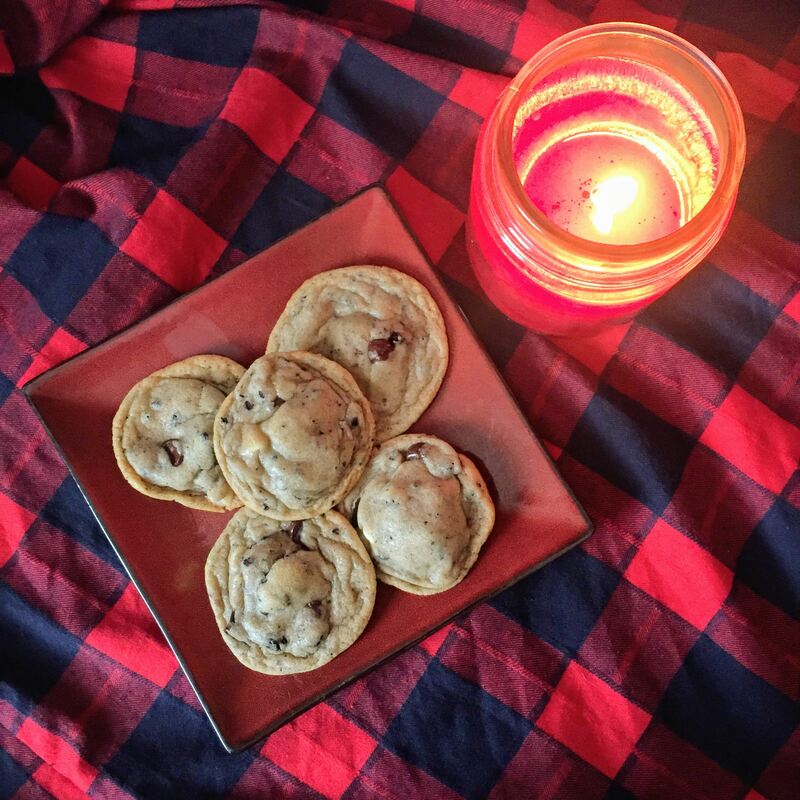 Note: These cookies are best consumed while wearing pajamas and watching the snow fall from your couch. 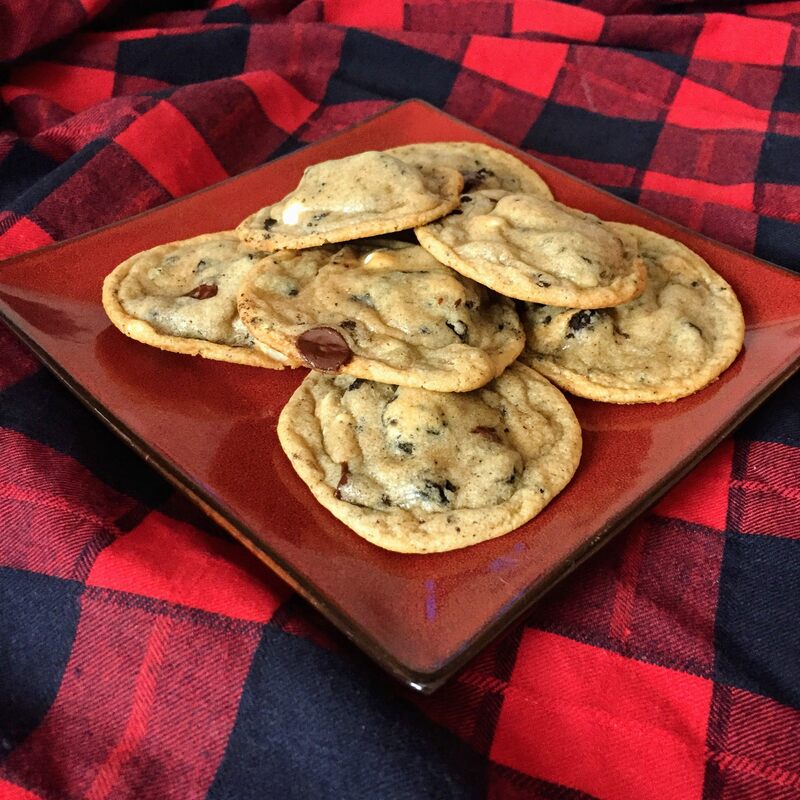 Chocolate chip cookies jazzed up with Oreo chunks and malted milk powder! Melt butter in a bowl in the microwave. Mix sugars and butter together in a large mixing bowl on medium-low speed until combined (30-60 seconds). Add in egg, egg yolk, and vanilla, mixing on low speed until combined. Add in baking soda, malted milk powder, and half of the flour. Mix on low speed until incorporated. Add the remaining flour, oreo chunks, and both kinds of chocolate chips, and mix on low until combined. Shape the dough into balls. Mine contained about 1.5 tablespoons of dough per cookie, and it made 27 cookies. Refrigerate the dough balls for at least 3 hours. This dough will need to be COLD when it goes into the oven or you will get flat cookies! Place cookie dough balls about 3 inches apart on a cookie sheet. Bake cookies for 9 minutes, turning at the halfway point. Allow the cookies to rest on hot cookie sheet for a few minutes before transferring to a wire rack to cool. 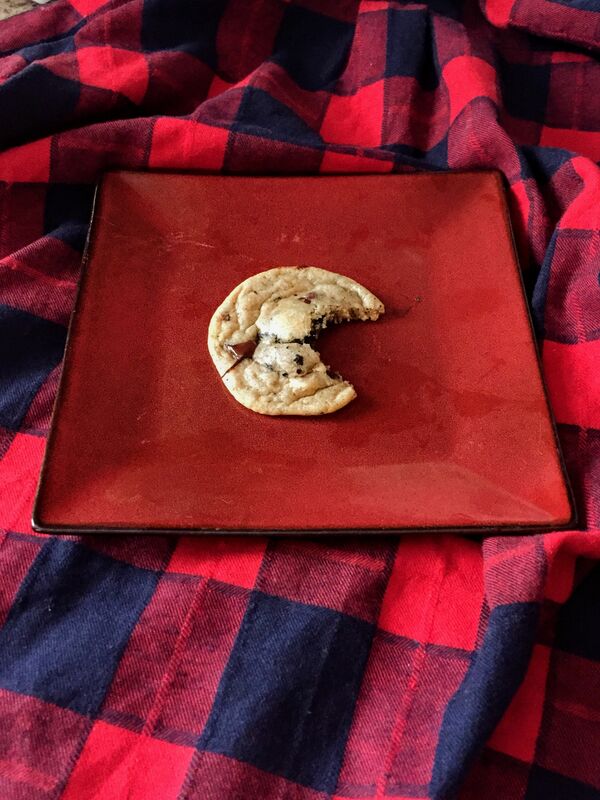 Note: I\'ve had success in freezing this cookie dough and allowing it to thaw in the fridge before baking. For the record, I think your photography is GREAT! And your recipes are fabulous! Blogging is not as easy as most people think it is, but I’m glad to see whenever you post! Keep up the great work! Thanks for your empathy and visit, Suz! I appreciate your encouragement, and I admire your diligence. You blog like it’s your JOBS (that plural is intentional). What’s your goal with your blog?